STOCKTON — Eric Humphries owes Allison Duncan's crew more than a big thank you. 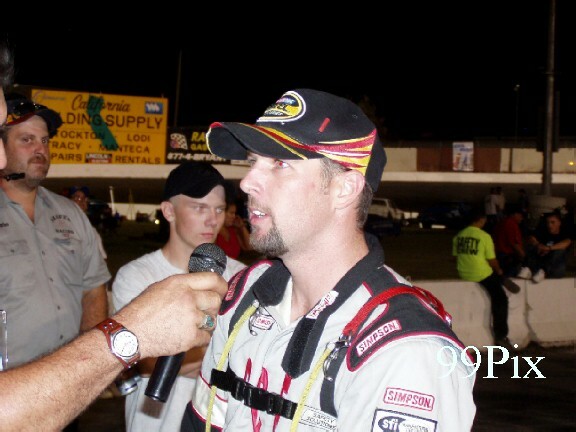 Before the 50-lap Western Late Model main at Stockton 99 Speedway on Saturday, Duncan's team let Humphries borrow a carburetor. 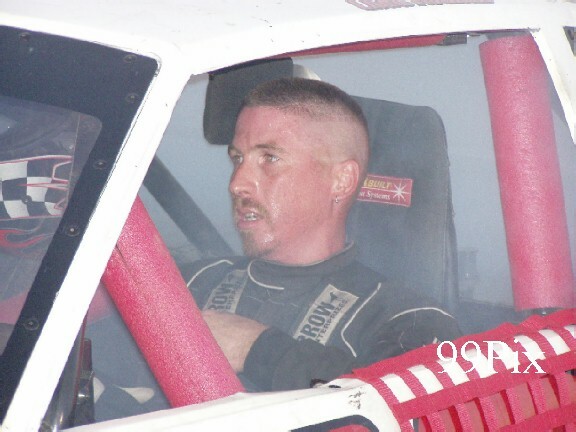 After a last-lap accident that knocked out leader Pete Anderson Jr. of Stockton, Humphries nosed ahead of Duncan for the victory. "There was something in my carburetor and I'd been beating my head against the wall for three weeks trying to figure it out," Humphries said. 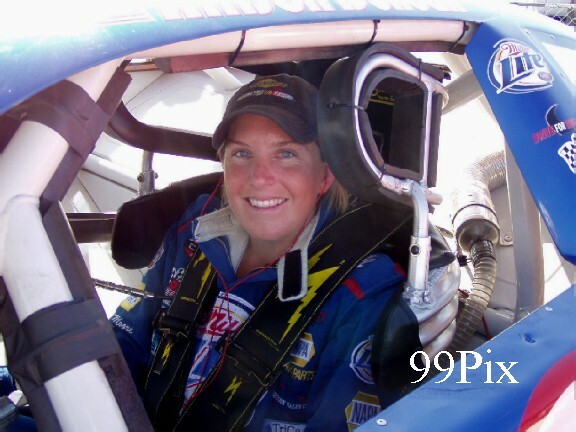 "We broke something in practice and her crew chief said he thought he knew what it was." But there wasn't time to fix it, so they borrowed one. "If it wasn't for Allison and her team I wouldn't be here," said Humphries, who thinks it was probably a $5 part that wasn't quite right. The Chowchilla driver was running on the back bumper of Duncan's car. They were jockeying for the second spot behind Anderson when he spun into the infield wall going into Turn 3. 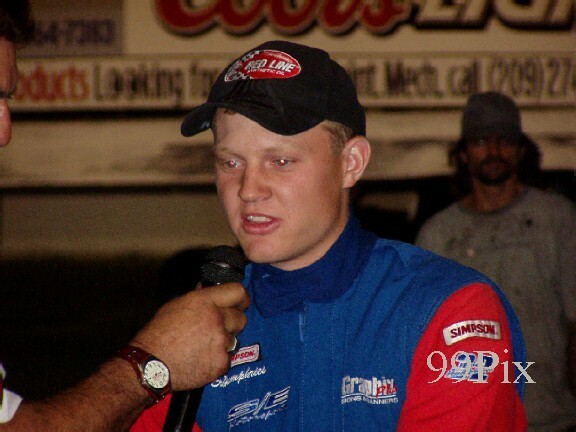 Anderson was trying to avoid the lapped car of Stockton's Dwight Pilcher, who only came out to help fill the field, making a minimum 15 cars to earn more prize money. Duncan said she couldn't avoid running into Anderson, who insisted she could have hit her brake. He filed a protest in the pits. "I couldn't go around him," Duncan said. "I do feel bad. I didn't mean to get into Pete. I didn't know what was happening. The next thing I see is the other car going around and I didn't know who it was." She found out quickly, but was the first one to rush to hug Humphries after her sixth second-place finish of the season. "Hey, hey, I want my carburetor back," she said as she approached him, her arms outstretched as if to say, 'What do think you're doing?'" The race was full of ill will, eliciting a number of "Whoas!" from the modest crowd of approximately 1,000. 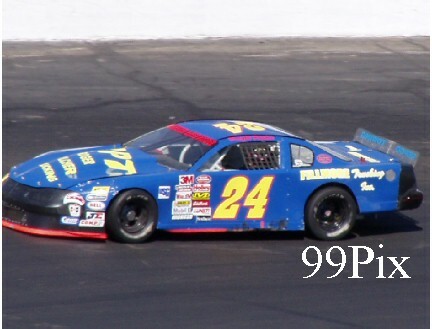 Pilcher#24, shot out of the pit gate in Lap 13. He had been lapped, and officials decided he'd been pushed out. 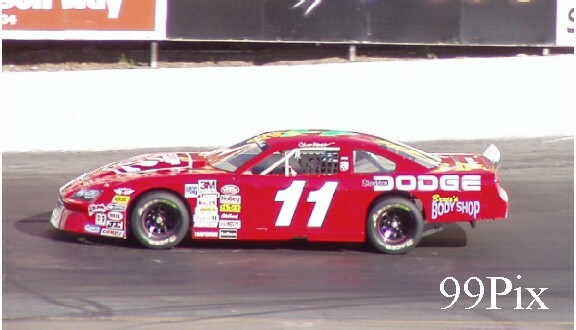 Pilcher returned to the race after replacing a broken spring. 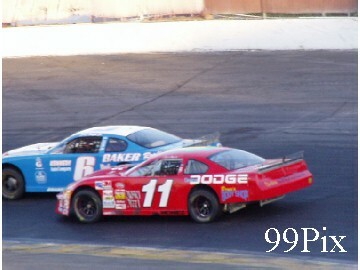 In Lap 22, Stockton's Gary Shafer was tapped by Turlock's Chris Monez, #11. Shafer couldn't control his car, wobbled and hit the wall on the back straightaway. Shafer yelled in Monez's window when he came around the track. Monez was running fourth at the time, but was sent to the back as a penalty. He worked his way through the pack to end up third. 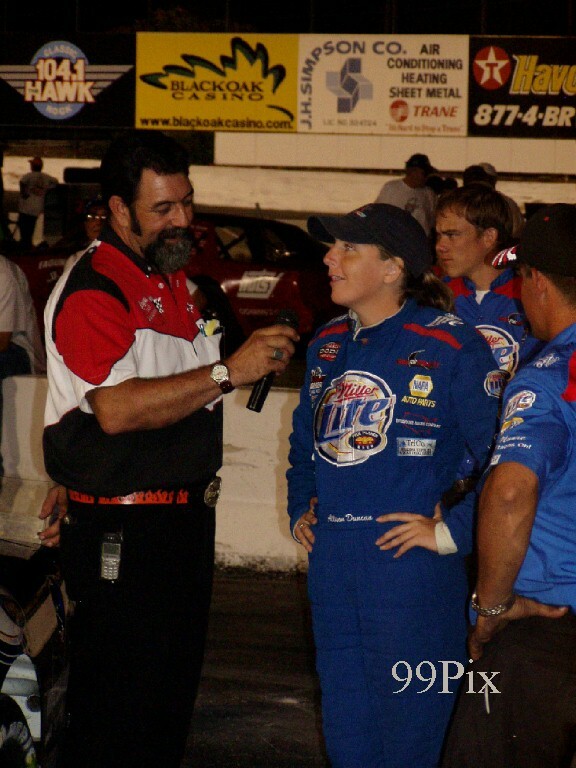 "I had my bumper at his door and in racing that's considered my line," Monez said. "He wouldn't give it to me. I kept checking up. After three times I didn't move." Monez, (right), said he did back off the throttle and Shafer lost control on his own. He tried to explain what happened when Shafer, (left), confronted him on the track, but Shafer was fired up. Monez said he earned a fifth place but lucked into a third. He didn't see what happened up front in the last lap, but he did see the aftereffect. "When I saw Pete spin low, I knew it wasn't going to be pretty," Monez said. Humphries agreed that the accident worked out in his favor and felt he had nothing to apologize for. 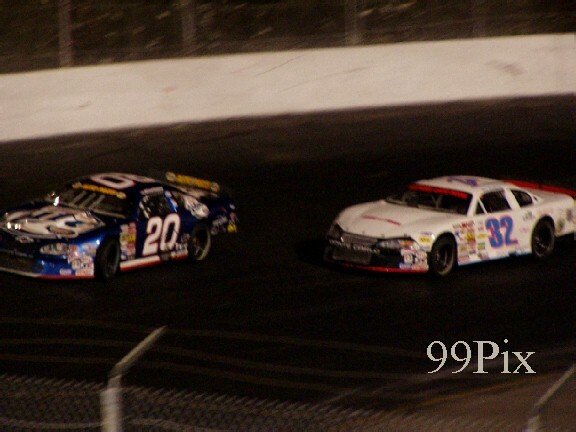 The entire 50 laps featured hard racing. 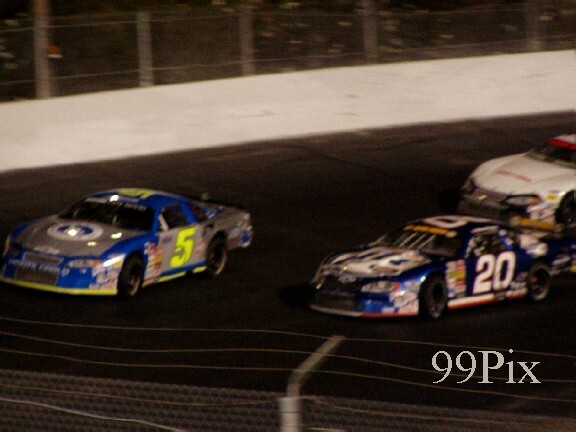 The last lap was the highlight for Humphries, though. "I thought 'This just isn't going to work out,'" Humphries said of viewing the accident. "When Allison checked up I went inside and got by her. I owe a big thank you to her crew." Modesto's #21, Kyle Gottula set the fast time and won his third Grand American Modified race of the season on a division double points night. It gave him redemption for losing 50 points last week for rough driving. He fell from the lead to third in standings going into the night. After leading most of the American Limited Modified Stock car race, Modesto's #15, Charlie Clawson was edged by Stockton's #75, Chad Holman, who also won the trophy dash. 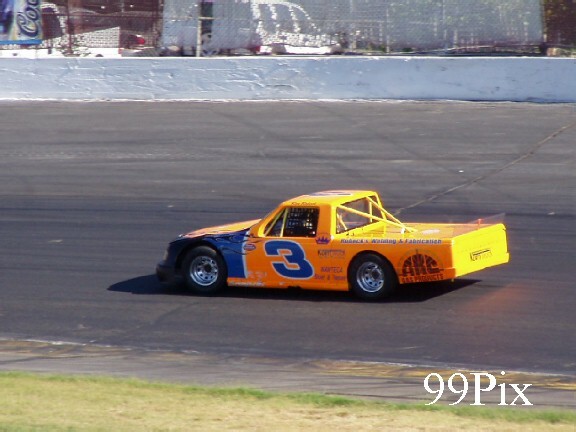 Ron Robeck, #3 from Milpitas cruised to another main victory in the Pro 4 Truck Division. 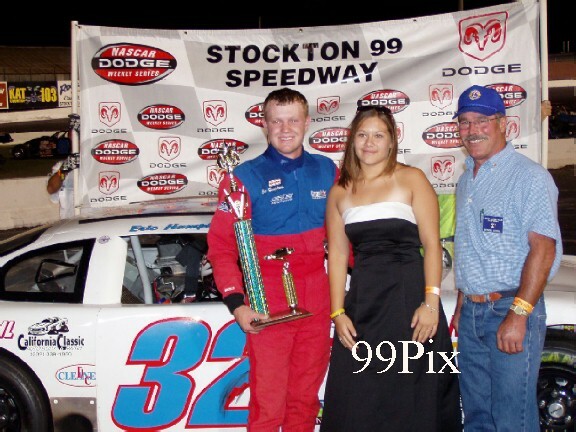 Bryan Hitchcock #38 from Manteca won the Dash. Next Saturday, for the fifth year in a row Modesto's Paul Dorrity will pass out 125 youth shirts on Kids' Night. The white shirts feature his No. 44 in a flame logo on the front, with a list of his sponsors on the back. He will also dole out 480 sodas. Bee staff writer Kelly Jones can be reached at 578-2300 or kjones@modbee.com. 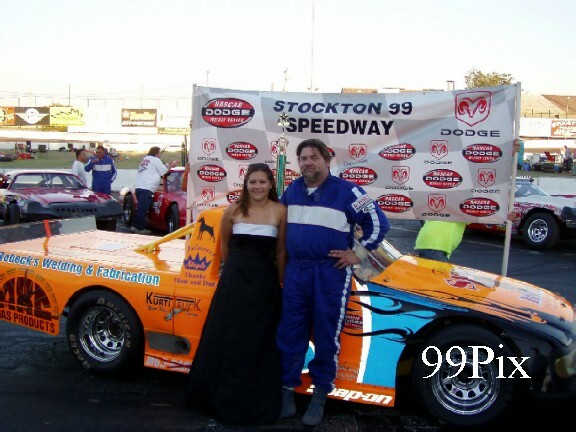 ATTENTION WLM DRIVERS: A LOCAL MERCHANT HAS OFFERED TOW MONEY FOR WLM AT STOCKTON 99 SPEEDWAY! An anonymous local merchant and long time fan has offered to pay $100 in tow money to all WLM'S that enter the July 30 and August 13, 50-lap WLM races at Stockton 99 Speedway. The tow money will be paid only if the car count reaches 15 WLM's or more. Tow money is offered on these two dates only. 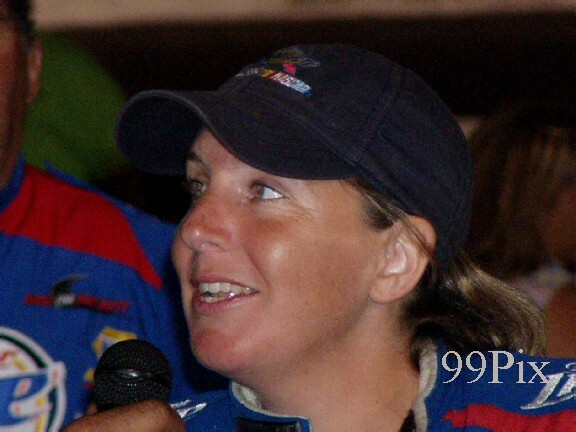 When asked if she regretted the decision to loan him the vital engine part, she replied “Not at all, no regrets, it was just one racer helping out a fellow racer.” Duncan finished second, Turlock’s Chris Monez came in third, Granite Bay's John Moore came in fourth and Manteca's Guy Guibor came in fifth. The double caution, single red flag race was full of excitement from start to finish. 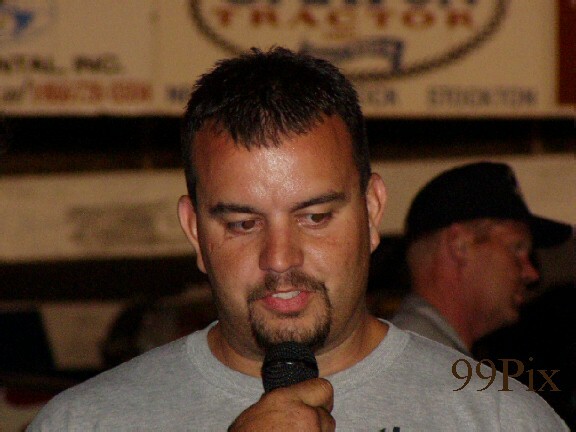 In lap-22 fast-time qualifier Gary Shafer Jr.,of Stockton, was knocked out of the race when Monez bumped him on the back-straight while attempting to pass. Shafer Jr. hit the wall and it looked as if his back axle broke free of the car’s frame. 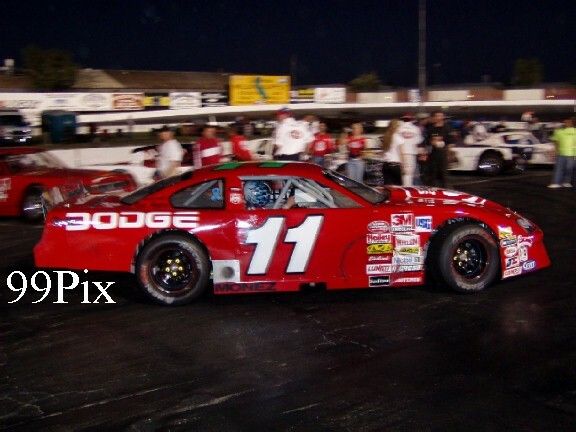 His number 6 would be towed from the track, but not before he strolled across the pavement to shout something inside the window of Monez’ passing number 11 STOCKTON DODGE Intrepid. Monez was penalized for the tap and sent to the back of the pack on the restart, but before the race ended he worked his way forward to earn his third place finish. Prior to the Monez/Shafer Jr. incident, the crowd held its breath when Pilcher’s car rocketed off the track out the back-straight pit gate. It breathed a sigh of relief when he returned to the race undamaged and unharmed. Officials determined that he had been forced out. 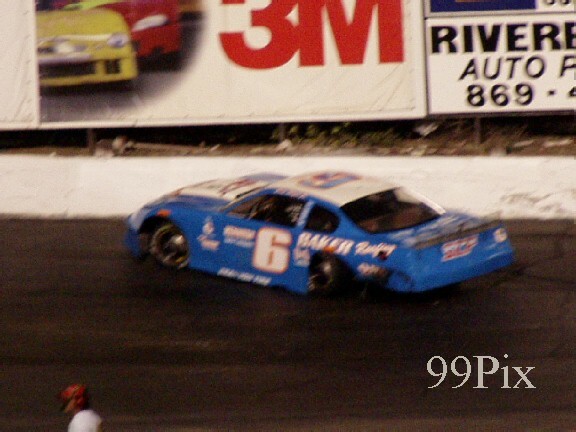 #5, Anderson Jr. recovered from his last-lap collision and ended up with an eighth place finish. 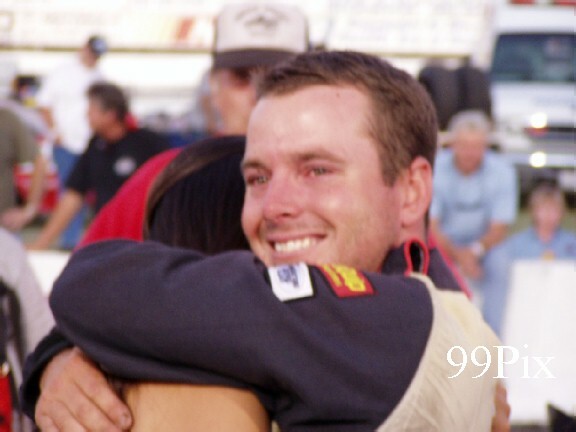 He managed to hold onto the division points lead, but is now only 2 points ahead of second place holder Moore, 715-713. Fifteen Western Late Models qualified for the race, so all earned $100 in tow money just for showing up. 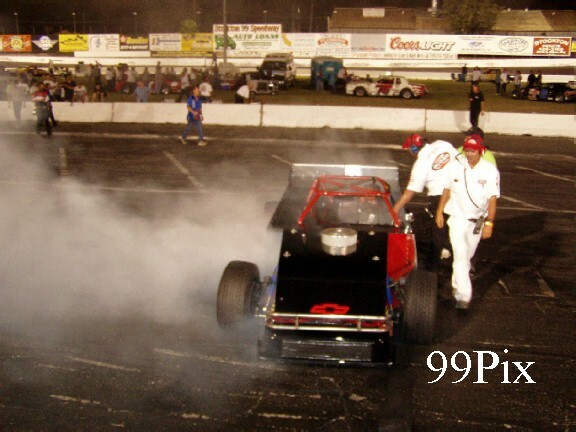 The number of cars pushed the winners purse to $1,000 for the third time this season. 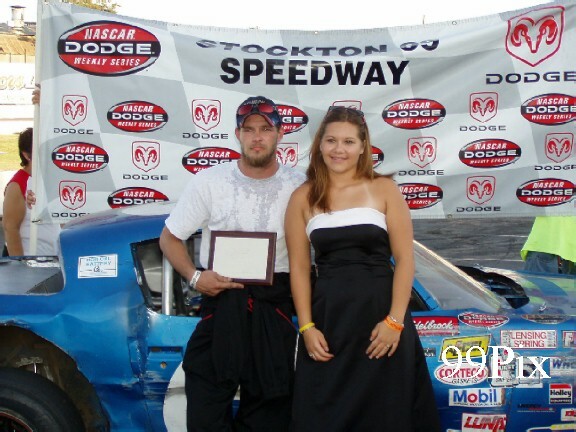 Stockton's #75, Chad Holman came from a fifth place start to win his second 2005 CL BRYANT American Limited Stock Car 30-lap main event. 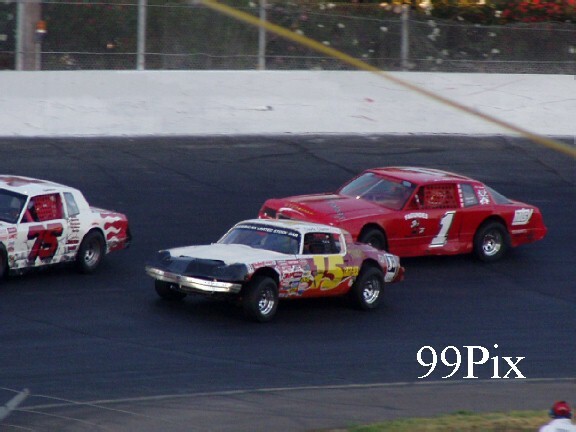 By lap-6 Holman had advanced to second behind Modesto's #15, Charlie Clawson, a lap-7 restart pitted the two frontrunners side-by- side, where they ran for two laps until Holman took the lead. Clawson came in second, #1, Stockton's Joe Allen finished third, Stockton's Mike Brooks Jr. came in fourth and Stockton's Dave Ball rounded out the top five. Added to this week’s ALSC racing was a “Slow Dash.” The feature pitted the four slowest qualifiers in a four-lap competition where #61, Stockton’s Russell Johnson Jr. took the checkered flag. 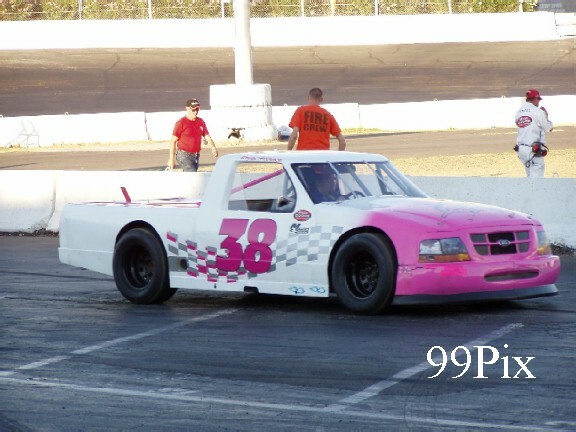 Milpitas' Ron Robeck won his second consecutive Pro-4 Trucks 25-lap main, which was his sixth of the season. 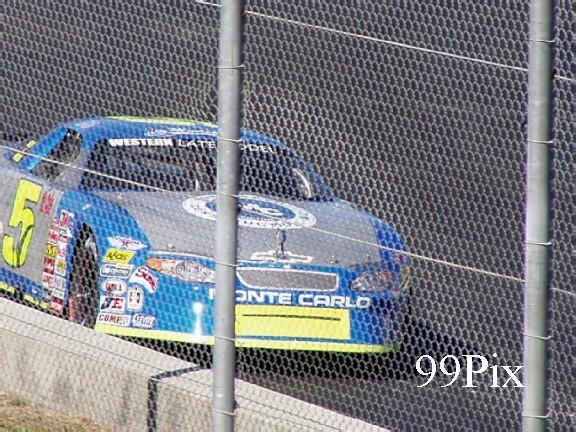 He started the race at second and ran door-to-door with Manteca's #38, Brian Hitchcock for two laps until taking the lead. Hitchcock came in second, division points leader Mark Henslee, of Lathrop, came in third, Lodi's Mike Curry came in fourth and Oakdale's Nathan McNeil finished fifth. 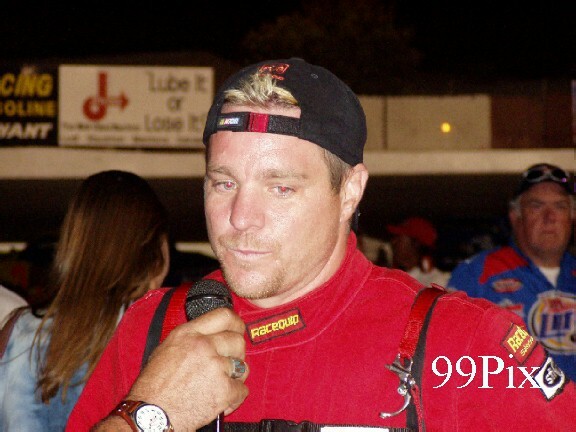 Oakdale’s Fred Hatch fielded two super minis on the track. 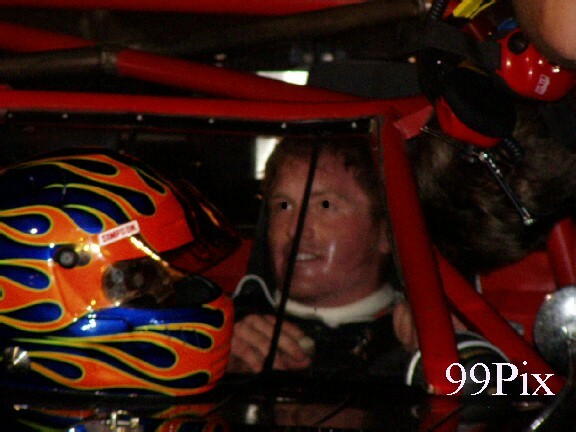 In addition to his number 20, driven by McNeil, he piloted the number 97. 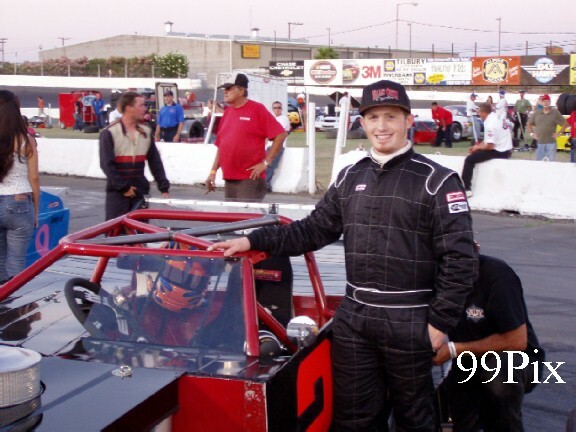 In the Grand American Modified 50-lap main event Modesto's #21, Kyle Gotulla passed Citrus Heights' Jay Linstroth #10a, in lap 35 to move into second place, then he passed Sacramento's Jason Philpot #5, in the final lap to take the checkered flag. Philpot took second, Ripon's Mike Regelman earned third, Linstroth took fourth and Modesto's Mike Beeler came in fifth. 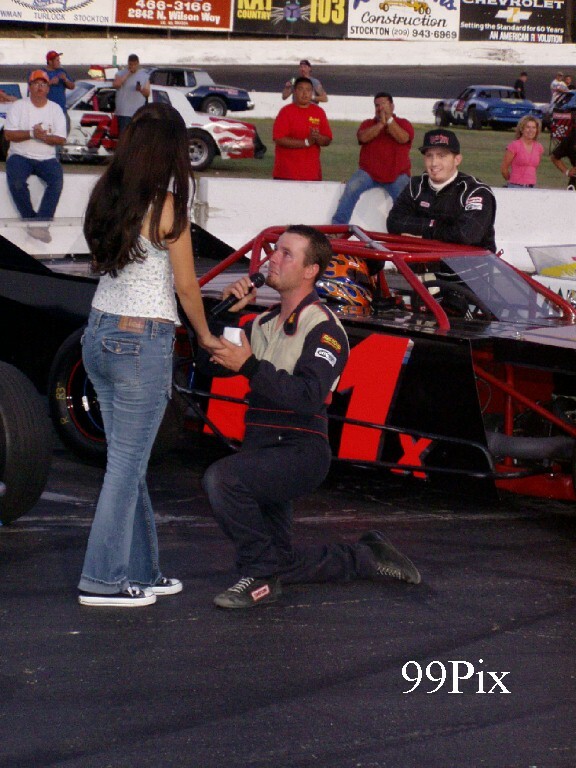 There was one surprise in the GAM field that took place before the race even started, it was when Stockton's Chris Mays got a "yes" from his girlfriend after proposing marriage to her during driver introductions. 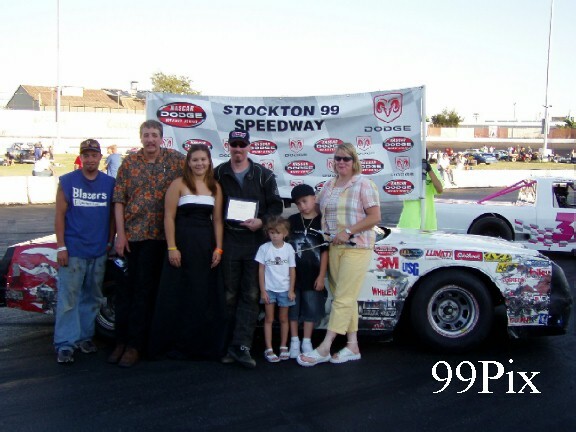 On Saturday, Aug. 6 Stockton 99 Speedway will once again host “Kids’ Night.” Sponsored by the Graduate Restaurant, Kids’ Night gives young race fans between the ages of 2 and 9 a chance to race their big wheels on NASCAR’s fastest quarter-mile oval west of the Mississippi. 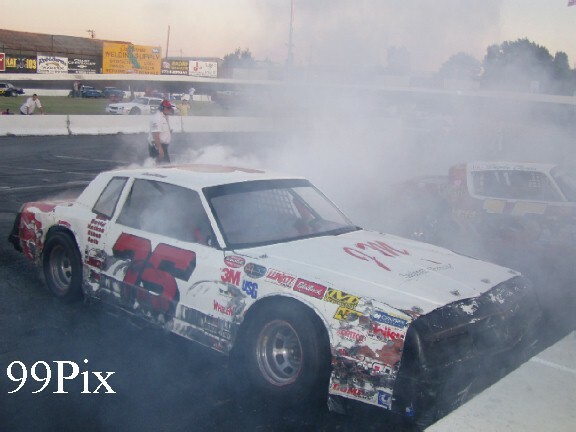 Also on the race card will be a HAVOLINE Western Late Model 50-lap main event, CL BRYANT American Limited Stock Cars, Pro-4 Trucks, Grand American Modified and Legends of the Pacific. WLM drivers remember: when at least 15 qualify the winner’s purse is $1,000; on Aug. 13 if 15 or more show up all will be paid $100 in tow money. 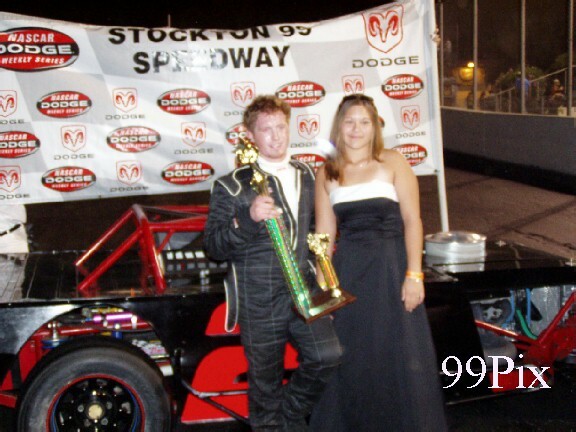 Parking at Stockton 99 Speedway is always free! !